Escondido Youth Baseball at Kit Carson Park. 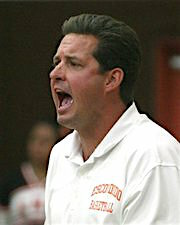 (Sport Shorts1) Escondido High boys basketball coach Paul Baldwin. Paul Baldwin, who is in his 18th season as boys basketball coach at Escondido, and Pat Moramarco, who is in his 19th season as girls coach at Vista have joined the 300-win club. Baldwin, now 303-211, has had six 20-win seasons, with seven league championships and three San Diego Section titles, including Division I last season. He led two other Escondido teams to the section finals. The Cougars were 1-25 the year before Baldwin took the job and 4-48 in the previous two years. The Cougars were 14-15 in Baldwin’s first season and won a league title in his fourth. This year they were 18-10, 9-1 in league play before falling 82-62 to Kearney High School in the CIF San Diego 2016 Boys Basketball section Championship. The Escondido Sports Center was the place to be for local high school roller hockey fans earlier this month. 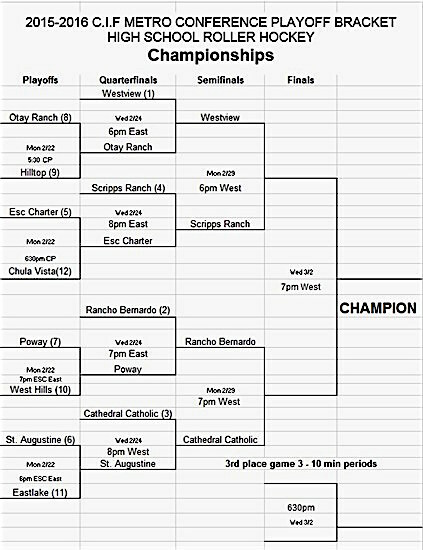 Westview High School out of the Poway Unified School District took home the Metro Conference Championship with a 13-3 blowout over Cathedral Catholic. This was the fifth championship for Westview, which opened its doors in 2002. The team finished 16-6 this year. While this was Westview’s fifth title, it also represented the school’s first championship since Smith took over the program in 2011. “We have made the finals three years before this,” Smith said. “With this group being so young, I can’t wait until next year. Cathedral Catholic finished the season at 14-6 mark under coach Luke Storno, They reached the finals through eliminating Rancho Bernardo, the three-time defending champion. Rancho Bernardo defeated the Cathedral Catholic in last season’s championship game and prevailed in a pair of regular-season wins over Cathedral this season. However, the third time wasn’t the charm for Rancho Bernardo as Cathedral Catholic beat Rancho Bernardo 6-3 in the tourney semifinal. Escondido Youth Baseball, offering programs for children aged 3 to 18 at a range of instructional and competitive levels, opened its spring season this month. The season continues through May. The All Star season begins in June and extends into the summer. The Spring Season features levels of recreational and competitive baseball from Shetland to Pony. It also features a Morgan program for children challenged with mental and physical disabilities, ages 5-22. For more information about the program, visit http://escondidoponybaseball.com. Be the first to comment on "Sports shorts: Basketball, roller hockey and Escondido Youth Baseball"